Recently, 12 third grade Girl Scouts from Fairmont, Van Buren and Rose Drive elementary schools visited the Placentia-Yorba Linda Unified School District (PYLUSD) McKinney Vento food/clothing pantry at Topaz Elementary School in Fullerton. 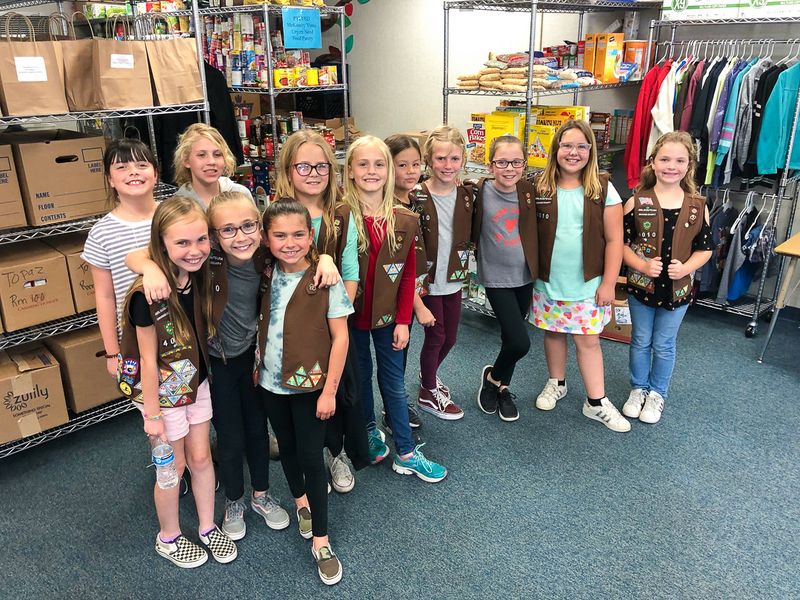 Led by Jennifer Jacobson, a PYLUSD teacher, and her co-leader Samanth Cadra, the girls have been working on their Scout badges and learning important philanthropic skills such as how to help those less fortunate in your community. The Scouts enjoyed their time at the pantry and brought items such as jackets, toiletries, and underwear that they had purchased with their fall proceeds from cookie sales. The girls were so excited to see where their efforts were going, and they enjoyed touring the food pantry. 1 Comment on "PYLUSD elementary Girl Scouts use cookie sales to donate clothes to McKinney Vento"
What a wonderful idea and a great photo! !